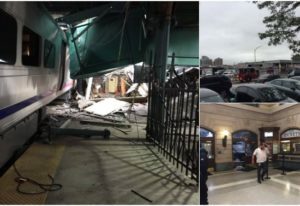 Train crash in New Jersey “Due to a NJ Transit train derailment at #Hoboken Station, NJ, all PATH train service in and out of Hoboken Station is suspended,” New York’s official emergency information system tweeted. New Jersey’s emergency management system was reporting more than 100 people injured, while the New Jersey transit service said there were “multiple” injuries, ABC News reported. Images on social media showed serious damage to the train station, with part of the roof apparently caved in. Video showed the station in shambles with the train tangled in wires and debris from what appeared to be collapsed portions of the roof. Emergency vehicles converged on the scene in response to the crash.